Two Years From Now... Barbara Gordon - who has faced tragedies and triumphs beyond imagining - will face one tragedy too many. But surrender is not an option! It never was for Barbara Gordon. That which does not kill her makes her stronger and she will become stronger still. Five Years From Now... Barbara Gordon is now known as Bête Noire - The Black Beast. And a trio of Batgirls protect the streets of Gotham under her command. Until one fateful night when a group of thieves proves to be something more. And Barbara Gordon knows she must finally confront the man who turned Batgirl into Bête Noire. This comic has little, if anything, to do with the overarching story of Future's End. That is to its benefit. What we have here is not a simple tie-in one-shot but the capstone on the pyramid of Gail Simone's Batgirl run and indeed the very concept of Batgirl as a whole. 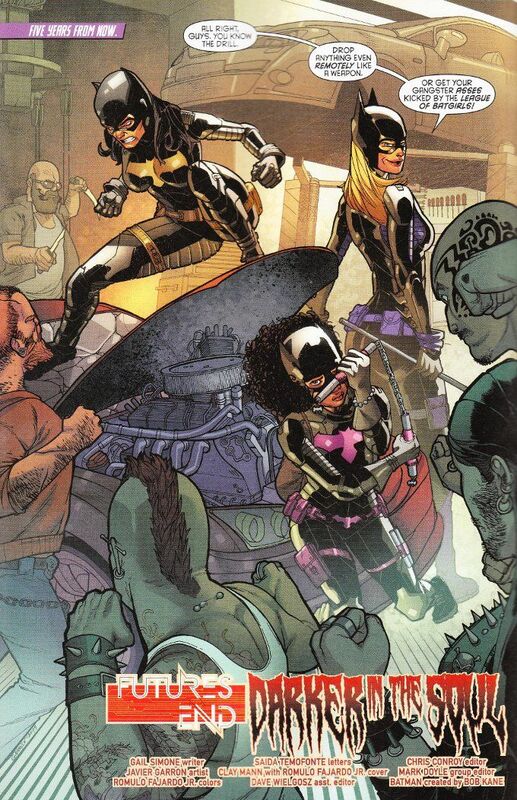 I dare say there are a number of fans who will be glad to see Stephanie Brown as Batgirl again, as well as Cassandra Cain, in what I believe is her first appearance in the New 52 universe. 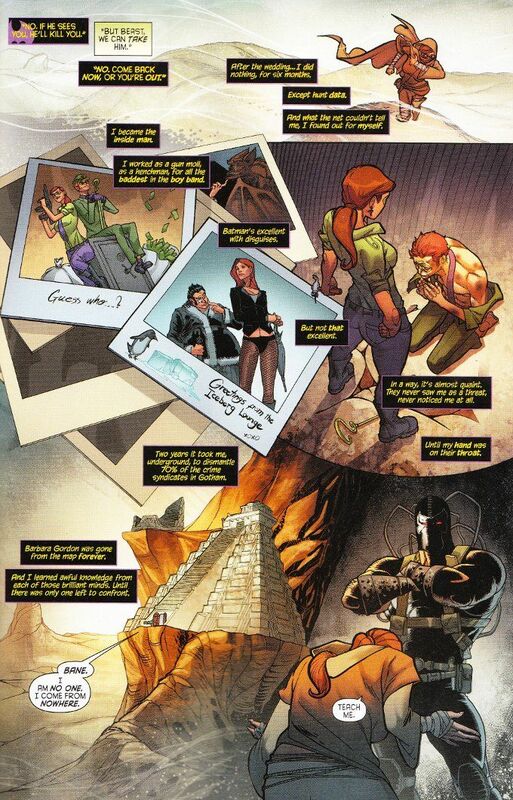 And it is a joy to see Gail Simone writing Bane again. But this issue runs deeper than simple fan-service or Simone indulging her strengths as a writer. This comic does for Barbara Gordon what Frank Miller's The Dark Knight Returns did for Bruce Wayne. I would, however, say that this story is better than The Dark Knight Returns in that it accomplishes its goals in a single issue rather than four. Simone's story distills Barbara down to her core elements and showcases who she is, no matter what mask she wears, in the face of her final battle. The artwork by Javier Garron justifies the faith I placed in him after his turn on half of Batgirl Anniual #2. It would have been nice to see Fernando Pasarin and Jonathan Glapion come back for one last hurrah for the sake of visual continuity but Garron's work is not bad by any stretch of the imagination. The action scenes are handled well and there's a number of good sight-gags in the backgrounds, such as the trophy room of Barbara's "Bat-cave". The bottom line is this - buy this comic. If you're a fan of Bane or any version of Batgirl, you should read it. If you're a fan of Gail Simone's writing, you should read it. And if you think you might enjoy a story that balances light humor and dark tragedy in perfect harmony, well... just read it!